So I was looking at my activities at Math.SE when I noticed that my edit suggestion for this question was rejected. I decided to take a look into the question again, and found that my edit only had one reject vote (by CommunityBot), while Davide's edit was approved. The only difference was that he added the "differential-equations" tag. Why did CommunityBot reject my edit? 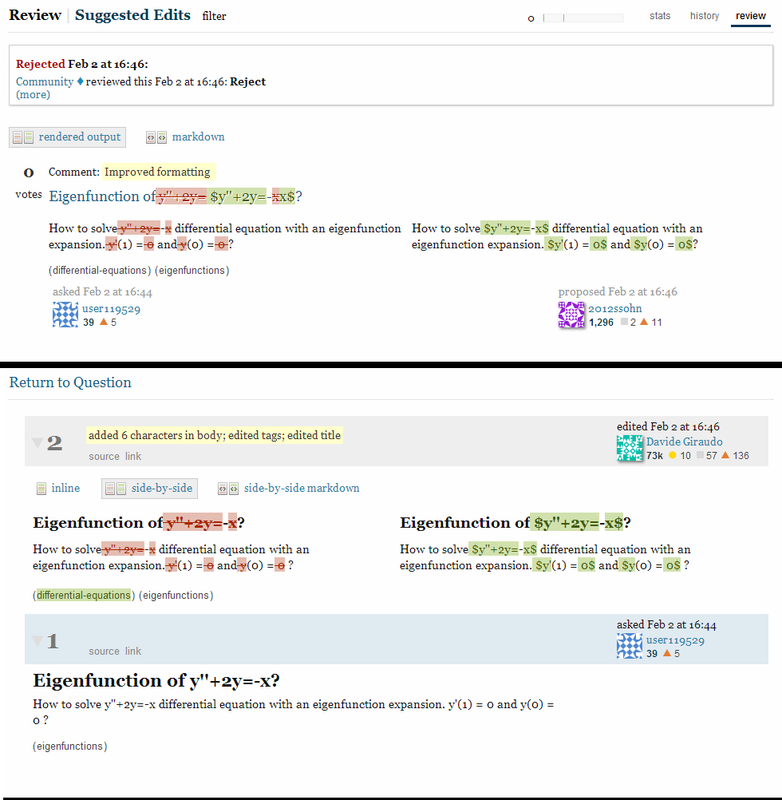 When a user with the edit privilege (reputation ≥ 2000) submits an edit, any pending suggested edit on the post is automatically rejected. The rejection is marked as performed by Community. You proposed your edit at 16:46:21. Davide submitted his edit at 16:46:38. You both edited from the original version of the post, and Davide's submission overrode yours. The similarity between the edits can be explained in that they are the obvious LaTeXifications of the post — great minds think alike. There is another case when Community is marked as having rejected a suggested edit: when a reviewer clicks “Improve” and then unticks the checkbox “Suggested edit was helpful”. Such edits mention the review as having edited the post; if that had been the case, there would be a line “Davide Giraudo reviewed this Feb 2 at 16:46: Edit” above the line with “Community …: Reject”. Here's an example of this case. Not the answer you're looking for? Browse other questions tagged discussion suggested-edits community-user . What happened to my suggested edit? What to do about edit being rejected for invalid reasons? Best approach for fixing a mistake when your edits are rejected? Why were my tag edits rejected with “This edit did not correct critical issues with the post”?